As Voyager 2 neared Uranus in January 1986, NASA scientists waited for the radio waves that would be the first evidence of the gas giants predicted magnetic field. They expected the field to be much like those of Jupiter, Saturn and Earth  a large-scale, stable field, much like a bar magnet, with north and south poles aligned along the planets axis of rotation. What they discovered instead was a small-scale fluctuating field with multiple poles and a 60-degree tilt toward the equator. Three years later, Voyager 2 flew by Neptune and detected a similar field there. Until now, scientists have been unable to effectively model and explain this odd behavior. 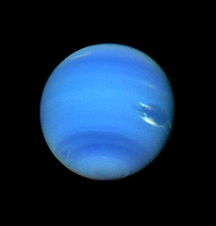 Neptune, captured on camera here by NASAs Voyager 2, and Uranus both have unusual magnetic fields that tilt at a 60-degree angle toward their equators. Scientists are now able to model the processes that shape the planets magnetism. Image courtesy of NASA/JPL. In the March 11 issue of Nature, Harvard University researchers Sabine Stanley and Jeremy Bloxham present the first model to successfully reproduce the planets magnetic fields. The results also show that despite Uranus and Neptunes unusual interiors, their magnetic fields nevertheless are generated by processes similar to those at work on Earth. The dynamo that creates Earths magnetic field is a thick layer of fluid iron vigorously convecting around an electrically conducting, solid-iron inner core. The solid nature of the inner core gives the field long-term stability by restraining the magnetic fluctuations that occur in the more changeable liquid outer core. And the strong differential rotation between the inner core and outer core causes the axis of the magnetic field to align with the rotational axis of the planet. In the early and mid-1990s, planetary scientists studying thermal models and luminosities of Uranus and Neptune proposed that, save a tiny rocky core, the interiors of both planets are composed of stratified layers of liquid methane, water and ammonia  often called ices  which are electrically conducting. The scientists hypothesized that a thin layer of such liquid convecting above similar, yet thicker and more stable, layers might produce the unusual features observed in the magnetic fields. Bolstering this hypothesis, the new model shows that a dynamo formed by the interaction of two liquids, as opposed to a solid and a liquid as in Earth, could produce smaller scale magnetic fields with multiple poles. Additionally, the lack of differential rotation between the two fluid layers would inhibit the alignment of the magnetic field with the axis of rotation, thus causing the tilted poles found by Voyager 2. Stanley and Bloxhams model clearly and impressively demonstrates that the same fundamental process ... can explain the basic structure of all the dynamo-generated planetary magnetic fields presently observed in the Solar System, writes geophysicist Jonathan Aurnou of the University of California, Los Angeles, in an accompanying Nature commentary. To create the dynamo, Stanley and Bloxham modeled a planet where one-sixth of the radius of the dynamo region is a rocky nonconductive core, one-half is a nonconvecting stably stratified liquid, and the top one-third is a convecting liquid. In addition to the radius, the researchers could vary other conditions, including how vigorously the convection is being driven and the stability of the interior. How the model responds will give researchers more information about the interior structures of the distant bodies. The findings may also play a role in future orbiter missions to the giant gas planets to better measure their magnetic fields, which would help determine the locations of their dynamos.